They say it, and you can’t. Here’s proof. The new waterfront promenade outside the old Herd St Post Office. Most ridiculously priced fish and chips in town, but hey, great spot for people watching. The new Kumutoto bridge. Surprisingly slender. And late afternoon: the sun pours in here. They’re absolutely right you know – you really can’t beat Wellington on a good day. The Waitangi Park grassed area near to the old PO building always seems to be waterlogged. I wish someone would drain it properly… I don’t want to play footie or anything, but it’d be nice to walk in a straight line across the park to, say, New World. Outer T really needs tidying up and I thought the Hilton was an okay way to do that. At the moment there isn’t really any reason to walk over there, except maybe to look at the helicopters or visiting warships. Then there are the carpark areas on the OPT end of Te Papa… Some of the best waterfront land in the country, and it’s used for parking cars? I’d build something on the site. And I’d love to drop Jervois (etc) Quay into a cut and cover tunnel occasionally, so that you could join a few bits of the waterfront up to the rest of the city in a pedestrian friendly fashion. Maybe at Queens Wharf, opposite civic center, and by Waitangi Park. If you did this, then could you build on top of the tunnel? And if so, would the value of the land created pay for the tunnel? Apparently a lot of the damage done to the Waitangi drainage systems was due to trucks carelessly driving over the field. Does anyone know about the current plans for the Te Papa carparks? There was the UN Studio art gallery + chinese gardens planned for there ages, but the gardens have since been relocated, and the gallery presumably stuck in limbo. I don’t want to cut and cover the whole length. But a hundred meters or so, now and then, would let you build a couple of buildings and a plaza on top and sort of bridge the gap between city and sea. But bridge it at grade, rather than making pedestrians climb up and over, or dash across at lights. It’s not as if you’d need to truck the diggings far away to dispose of them. Just tip them in to the harbour and reclaim some more land. So the costs would be diggers, rerouting of services, retaining walls, a roof, and some way to pump out rain. None of which sounds like rocket science to me. Now we all know that roads can go down a lot steeper than NZ traffic engineers give us credit for (read: Hong Kong, Paris et.al) however that is what we are stuck with. So unfortunately it does seem as difficult as rocket science at this stage. I know that Jan Gehl saw Jervois and Customhouse as real problems urban design-wise. They seperate the city from the harbour edge. Kerry’s answer was to put lots more lights (Brandon, Waring Taylor etc) to help with pedestrian assimilation, and some pohutakawa’s (which I love). The number of lights along there is just getting ree-diculous now. Seriously! I nearly mistook the green light at the junction ahead of me for the one I was sitting at (which was on a red). Just build more freaking overbridges for chrissakes! Just build more freaking overbridges for chrissakes! Overbridges benefit cars, not pedestrians. Overbridges give cars a free passage, but give pedestrians a giant flight of stairs that they have to lumber up and then down. Annoying but usable if you’re able-bodied, not so great if you’re elderly or disabled. The only pedestrian overbridge in Wellington that works is the one in the City to Sea walkway. Why? Probably because it has a fairly gentle gradient, ramps for those who need them, seating around to give it a more human, friendly feel, and a nice wide scale. Oh, and the Para Matchett sculptures! Compare that with the one that runs from Frank Kitts Park to Harris Street. It’s a bleak concrete chute that seems to almost exist as an embarrassed apology to the motorists rushing under it for the annoying pedestrians who insist on walking from one side of Jervois Quay to the other. That’s what I meant – pedestrian overbridges. And I agree, they shouldn’t just be a bridge (otherwise it’ll end up being like downtown Singapore). I think a perfect place for one is off Post Office Square. I reckon just close one half of Jervois/Customhouse quay and make it three lanes, with one that changes during the peak times. At peak you’ve got a free drive down the offpeak direction until you hit Chaffers or the Station. Most of the time it’s just a big empty highway. Make Cable Street and Wakefield street two ways. Narrow and slow down the bit that links the Taranaki/Wakefield intersection at Roadmaster – turn that wedge next to Michael Fowler into a civic square type place except lined with cafes and shops and you’ve got a pretty natural gateway to the waterfront from Te Aro. You’ve got two major pedestrian shafts there, from Cuba street straight down to Civic Square and then Willis through Bond crossing Cuba to St.Johns/Te Papa/Lagoon, especially if Manners street becomes the bus route. Bond street and those little lanes (Cornhill or something?) should be the new Left Bank except less grotty. Bridges can be nice but they make the road underneath into a highway – I used to rave on about the potential (and architectural potential) of pedestrian bridges until Mum started finding it difficult to climb stairs. Cut and cover is nice too, but it just segregates people and cars and leads to things like giant walls along Cobham drive, idiot decisions like block links between side streets (like Glover Street or Kensington or the two in front of and behind the Vic Architecture school where they’ve built those apartments, preventing cars from making right turns etc. and instead forcing them onto the arteries. The number of times we’ve lapped half the town looking for a park when we should have just been able to make a right turn is ridiculous. And it turns the arteries into fast moving high frequency roads instead of city streets. Victoria street for example should be a city street, but it’s where all the Brooklyn-bound traffic is channelled. Mobsta>It is my understanding (and I maybe wrong) that the slope required to get cars down underneath a platform, far enough (to allow for structure etc) means that, under NZ roading standards, the ramp down would have to be 1km (or more) long. That doesn’t sound right. The bypass only needs a hundred and fifty meters or so to drop from grade at Willis St to pass under Vivian St. I figure that the trolley bus lines look as if they’re about 8m above ground. Pop a couple of meters of earth on top and you’d be looking at a drop of about 10m. At 1:10 (which is about what Ngauranga Gorge is), you’d need 100m ramp and anything more is just a bonus. An underpass for cars, with level pedestrian access to the waterfront, would be such a great gesture for the city. Assuming that you could ramp down, and assuming that the city authorities would ever want to ramp down (this is all so hypothetical of course), but given that it would cost millions (if not tens or hundreds of millions), and so the city could do it only once: the question surely is, where would it go? There’s only a few viable zones: firstly instead of City to Sea bridge so that Civic Square could seamlessly link over to the lagoon as it should, instead of the circuitous route it now does; secondly at the bottom of Taranaki St, allowing both Cuba and Courtenay pedestrians to effortlessly access Te Papa as a primary destination without the risk of being flattened by the massive highway impediments we have at present; thirdly for me it would be either Whitmore or Waring Taylor, permitting the lunchtime shoppers of Lambton Quay to segue to the promenade along the shore. Effectively you’d need to ramp down over one block, and then ramp up again over another block. Main problem really would be the massive water pressure from the sea – any tunnel you dig down would face huge uplift from the water table, and so it would need to be tied down with a thicket of piles, or, here’s a thought: built over on top to keep it weighted down – and you gain free building spaces with waterfront views to boot…. Wouldn’t you all rather spend the money on LRT or a cut + cover subway around the quays? 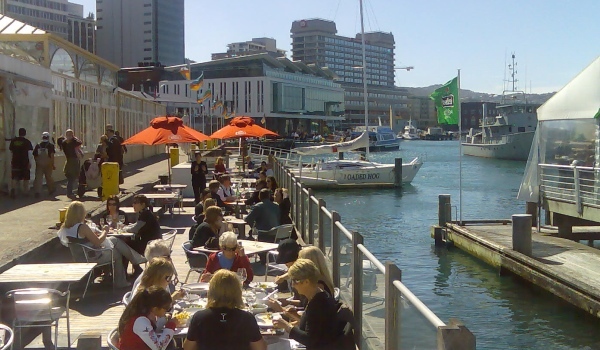 You’re probably talking a similar amount of money, and one could argue with a subway to Taranaki Street or LRT to Newtown you could afford to reduce the number of lanes on the waterfront to a more managable level. Also, I don’t think it’d look so good to go up and down, there are a lot of these kinds of things in cities like paris, and they look pretty ugly imho. If the road were simply reduced to 4 lanes, and tarted up with nice pedestrian crossings and tree lined with nice footpaths, I think it’d be surprising just how much more inviting it was. erentz – that’s what i was trying to indicate with the link to Boston’s “Big Dig” site. $5 billion US for the project, and about 10 years to build. Why, you could buy a whole US bank for that – or probably a small 3rd world country … hold on, we are a 3rd world country.